Clothes can be expressions of one or so it seems. In “Fresh Dressed” the exploration of fashion in the hood is brought to the silver screen. 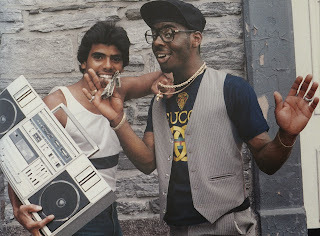 We are taken through the different decades of when fashion and hip hop started. Mink fur, Polo puffy vests, Louis Vuitton rapper jackets, and many other clothing are included in the film. Every member of the audience is exposed through animation and real footage of what life was like in the ghetto. The Bronx is where it all started. I really came to understand the hardship of what minorities were going through in the 70’s-2000’s and their coping skill of clothing. In the film was a very detailed step-by-step look at the companies who started this fashion phenomenon. I started thinking to myself while watching this about how healthy it was to idealize material things. The several black celebrities interviewed make it very clear that the way they had voice was through clothing. I think that people watching this were forced to recognize that not everybody grows up in a decent home. The reasoning behind the love of goods is validated through this heavily researched piece. Some of the jackets and pants people were wearing were incredibly stylish and out there. The matching Adidas sneakers, jacket, and pants brought me back to the origin of rap. There is an out of the box story about Dapper Dan who took luxury brands and remade them into street cool clothing. He then gets shut down based on copyright infringement. There are scenes when the Tommy Hilfiger brand takes their clothes to the hood and gives them out for free. This is of course was using the people who couldn’t really afford the items to advertise. The impact that the hip hop genre had on the fashion was repeated many times because of how significant the footprint really was. My eyes were staying on the screen especially when the story of how brands became successful was illustrated. It was just fascinating how these brands, such as Karl Kani, started by just talking to the right people and realizing a trend. This film is incredibly informative to anyone. It doesn’t matter if you’re 16 or 80 this was a historic event that took place from the bottom class up. Even though clothes are not everything and there are more important things in life, the dress ware shown made me want to wear it. This is the first film about fashion that really threw me into the pool.